The Mo’Beats Portable Stereo Bluetooth Speaker Stand is an elegant 9-1/2″ bar of extruded, anodized aluminum containing a 40mm speaker at each end with the electronics protected deep inside. It pairs with iPhones and iPads via Bluetooth so the sound from them is transmitted wirelessly to the Mo’Beats unit. 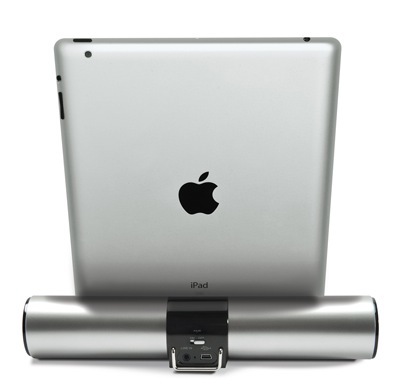 The speaker stand is configured so that the iPad props up securely at a comfortable viewing angle of 70 degrees in either portrait or landscape position. The slot that holds the iPad has protective silicone pads and is wide enough so that it will accommodate the iPad in many cases without having to remove them. The unit connects to the iDevice wirelessly so it doesn’t have to be used as a stand; it just needs to be within Bluetooth’s 25 foot range. There is no volume control so levels must be controlled from whatever source is being used. 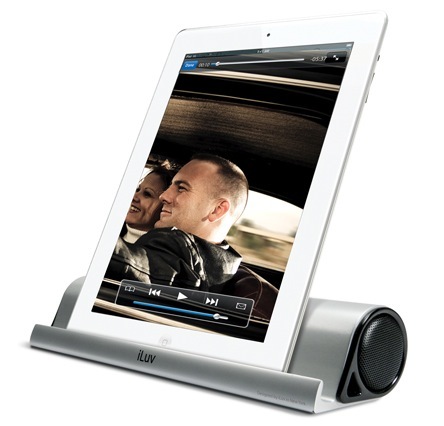 Being a very substantial piece of aluminum, this speaker stand is rugged and weighs in at a hefty 1 pound, 2 ounces. It contains a rechargeable lithium-ion battery and includes a micro-USB to USB cable. A full charge will provide over five hours of playback. In addition, an oversized drawstring pouch is provided for protection. The pouch is made of soft ultra-suede which doubles as a convenient fingerprint cleaner for the iPad’s screen. On the back of the unit there is a power switch, a micro-USB socket for charging, a Bluetooth pairing light, and a 3.5mm Line-in socket. This socket allows non-Bluetooth devices to be connected directly for playback. When an iPad is standing tall in portrait mode, the speaker stand is stable for viewing, but if you intend to use its touch-screen features, it can be a little tippy. However, there is a integrated leg on the back that can be pulled out to make the unit more secure. A nice touch. The sound quality is a bit disappointing—it’s bass-deficient. Tweaking the tonal contours with the iTunes equalizer helps a little, but for a device at this price the overall sound quality should be better. This may be asking a lot from a pair of very small speakers, but competitors are producing products with similarly sized speakers that have better bass response. This unit produces acceptable sound quality and does not distort at high volumes. Only the low-end of the sound spectrum is underwhelming. My Mac Review rating 8 out of 10.